If you’ve been following me for a bit, you’d already know I have developed quite the fondness for my slow cooker. Prior to attempting this dish, though, I had never made a Beef Pot Roast in the slow cooker. I wasn’t sure how well it would turn out – but as with most things slow cooker, there isn’t too much that can go wrong! In short: it was absolutely amazing. This recipe was so tasty that I had to share it with you. Apart from the awesome texture of the beef, the real wow factor of this dish is the Worcestershire sauce. I found an amazing recipe for a healthy Worcestershire sauce over at Paleo Table and I have amended it slightly, with the inclusion of Coconut Vinegar ‘Balsamic’ Style, which can be found at your local health food shop or online. 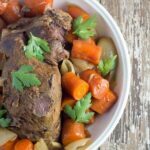 I have been making quite a few meals using my slow cooker lately, so far my favourites include Osso Bucco, Cashew Chicken and this Beef Pot Roast. I hope you like my recipe as much as my family and I did. Add arrowroot (tapioca flour) and water to a small bowl and stir until smooth, pour into slow cooker. Add carrots and onion to the slow cooker, sprinkle with sea salt and pepper and mix until well coated. Season the roast with sea salt and pepper then place on top of the vegetables. Pour the Worcestershire sauce over the top, cover and cook on high for 6 hours or low for 10 hours. If you can, pour some of the pan juices over the roast, this will ensure that it is really moist when it is time to serve. Remove from the slow cooker and transfer to a plate and let it rest for 10 minutes. Thinly slice and serve with the vegetables and pan sauces. Add all ingredients in a small saucepan and whisk to combine. Slowly bring to a boil over medium heat, then reduce heat to low and simmer for 2 minutes. You will have some Worcestershire sauce left over. You can keep in the fridge in an airtight jar or container.